The Redwood National and State Parks (RNSP) are a complex of several state and national parks located in the United States, along the coast of northern California. 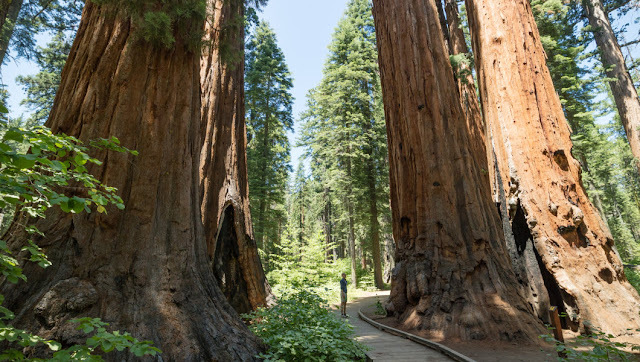 The damage done to the ecosystems of the redwood forests means that it will be many years before they can return to their former condition, considering that the trees can live up to 2000 years and grow to over 300 feet in height. It is covered with a magnificent forest of coastal redwood trees, the tallest and most impressive trees in the world. Redwood National Park has 37 miles of coastline on the Pacific Ocean. Comprising Redwood National Park (established 1968) and California’s Del Norte Coast, Jedediah Smith, and Prairie Creek Redwoods State Parks (all 3 dating from the 1920s), the combined RNSP contain 560 square kilometers (139,000 acres). Approximately half of the remaining redwood old growth trees are located in the Redwood National and State Parks system. The National Park Service (NPS) and the California Department of Parks and Recreation (CDPR) administratively combined Redwood National Park with the three abutting Redwood State Parks in 1994 for the purpose of cooperative forest management and stabilization of forests and watersheds as a single unit. Within Redwood National Park live a variety of species of rare animals and birds, some of which are on endangered species lists. The park’s primary feature, the coastal redwood forest is a surviving remnant of the group of trees that has existed for 160 million years and was once found throughout many of the moist temperate regions of the world, but is now confined to the wet regions of the west coast of North America. Threatened and endangered species found in Redwood National Park include Chinook salmon, Steller's sea lion, northern spotted owl, tidewater goby, and the bald eagle. The Boone and Crockett Club worked hard in the early 20th century to help preserve the redwood forests. The club founded the Save the Redwoods League which bought land to include in conservation efforts. Animals that can be found in Redwood National Park include cougars, black bears, beavers, bobcats, coyotes, elks, black-tailed deer, river otters, California sea lions, harbour seals, and Roosevelt elk. Redwood National and State Parks contains 45 percent of the remaining protected old-growth redwoods; totaling at least 158 square kilometers (238,982 acres). Big brown bats, red squirrels, northern flying squirrels, pelicans, sandpipers, cormorants, great blue herons, osprey, and red-shouldered hawks are found within Redwood National Park. When redwood harvesting began in the early 1850s, over 2 million acres or about 8,100 square kilometers of old-growth redwood forests existed. Types of amphibians found in Redwood National Park include rough-skinned newts, northern red-legged frogs, giant salamanders, and the northwestern ringneck snakes. But Euro-Americans took less than 60 years to reduce this number into hundreds-of-thousands of acres. Thirty invasive species have been identified in Redwood National Park including poison hemlock and knapweed. By the late 1910s, a preservationist group called the Save-the-Redwoods League began purchasing large tracts of redwood acreage in an effort to save the quickly disappearing forests. Prescribed fires are sometimes used to manage the ecosystem in Redwood National Park, which can help to remove exotic and invasive species, as well as eliminate the dead trees and provide more fertile soil for the healthier trees to survive. Redwood National Park was created in 1968, by which time nearly 90% of the original redwood trees had been logged. There are approximately 200 miles of trails for hikers and bikers to explore Redwood National Park. While come Native American groups continue to live within Redwood National Park's boundaries, they lived in the area for several thousand years prior to European settlement in the region, which resulted I logging and mass destruction of the environment. The Redwood National and State Parks today form a World Heritage Site and are part of the California Coast Range Biosphere Reserve, designations that reflect worldwide recognition of the parks’ natural resources as irreplaceable. More than 320 kilometers (200 miles) of trails weave through a variety of environments, including prairies, old-growth redwood forests, and beaches. Elevations range from sea level to just over 1,000 meters (3,000 feet). Consistently mild temperatures make year-round exploration a possibility. The trees at Redwood National and State Parks can stretch over 90 meters (300 feet) high and live for more than 2,000 years. Redwood National Park was added to California Coast Ranges International Biosphere Reserve in 1983. The tree nicknamed Hyperion was measured at 115.92 meters (380.3 feet), which ranks it as the world’s tallest known living tree. It is followed by Helios and Icarus which were 114.7 meters (376.3 feet) and 113.1 meters (371.2 feet) respectively. Redwood National Park was designated a UNESCO World Heritage Site in 1980. Redwoods are highly resistant to disease, due to a thick protective bark and high tannin content. They prefer sheltered slopes, slightly inland and near water sources such as rivers and streams. In addition to the redwood forests, the parks preserve other indigenous flora, fauna, grassland prairie, cultural resources, portions of rivers and other streams, and 60 kilometers (37 miles) of pristine coastline. In 1850 there were over 2 million acres of old growth redwood forest in California. Logging nearly wiped out the redwoods by 1968 when Redwood National Park was established. The ecosystems of RNSP preserve a number of rare animal species. The tidewater goby is a federally listed endangered species that live near the Pacific coastline. The bald eagle, which usually nests near a water source, is listed as a state of California endangered species. The Chinook salmon, and northern spotted owl, are a couple of the other animal species that are threatened. Approximately 280 species of birds have been recorded within boundaries of Redwood National and State Parks. Over 40 species of mammals have been documented, including the black bear, coyote, cougar, bobcat, beaver, otter, black-tailed deer, and elk. Along the coastline, California sea lions, Steller sea lions and harbor seals live near the shore and on seastacks, rocky outcroppings forming small islands just off the coast. Dolphins and Pacific gray whales are occasionally seen offshore. When hiking through the redwood forest in Redwood National and State Parks one may encounter many spineless creatures, however, there one highly unusual: the banana slug (Ariolimax columbianus). The banana slug is so named because it resembles- what else?- a ripe banana. The native people of the North Coast region have made the redwood forests and associated ecosystems their home for thousands of years. These American Indians spoke many different languages and held numerous and distinct identities. Today, the descendants of these people continue to live on and off reservations in the redwood region.